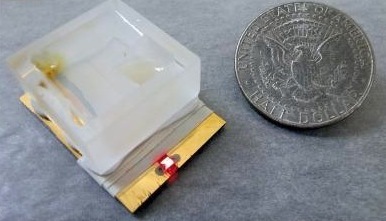 Using little more than Jell-O, aluminum foil, milk protein, and a 12-cent LED, University of Texas scientists have hacked together a super-cheap, fast-acting detector for pancreatitis. The researchers in Austin have effectively created a sub-one-dollar instant detector for pancreatitis–a disease characterized by sudden inflammation of the pancreas that can cause a number of unpleasant symptoms and even death. Here’s how it works: A drop of blood is first applied to a layer of milk protein and gelatin. 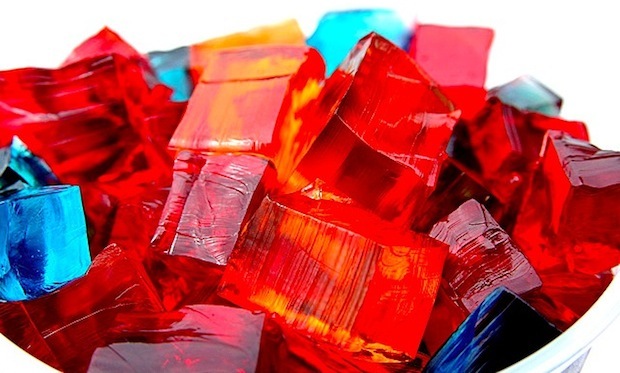 If the blood is from a pancreatitis sufferer, it’s full of the enzyme trypsin, which will then break down the gelatin. A drop of simple sodium hydroxide is applied–and if the gelatin has been broken down enough, the sodium hydroxide reaches a layer of aluminum Reynold’s wrap, where it begins to dissolve it. At this point, a circuit opens between an anode made of magnesium and a cathode of iron salt. In simple terms, this turns the entire device into a tiny battery which generates an equally tiny but detectable current. This current lights a minuscule LED, an easy signal that even an untrained eye can spot. The entire test takes just one hour, and if the light goes on, the patient has pancreatitis. The team, led by graduate student Brian Zaccheo, has a provisional patent on the device–and they predict it has uses in places like the developing world or after a natural disaster, where its simplicity and low price could be of great benefit, especially since it doesn’t even need batteries. Technically, its low price also makes it handy in regular hospitals. Amid an explosion in tech that promises super-fast, accurate nanotechnology disease detection, it’s also a reminder that sometimes innovative low-tech solutions can be excellent.